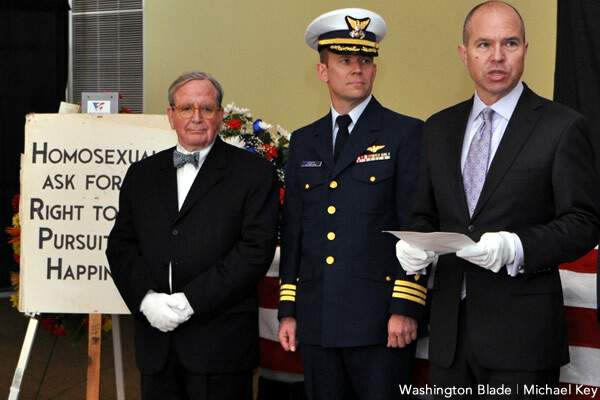 November 3, 2011 at 9:49 pm EDT | by Lou Chibbaro Jr.
Mayor Gray said Kameny’s civil rights work led to a “massive, positive change” in the way LGBT people live their lives both in D.C. and across the nation. At the other end of coffin stood a portrait of Kameny painted by local gay artist Don Patron. Norton, a leader of the black civil rights movement, said Kameny’s acts of “defiance” and “raw, pure undiluted courage” during the decades he fought oppression against LGBT people put him in a place similar to that of black civil rights legend Rosa Parks. Norton noted that Kameny began his fight for equality and justice for LGBT people shortly after he was fired for being gay from his job as an astronomer with the U.S. government in the late 1950s. Kameny died in his home Oct. 11 at the age of 86. Organizers of his memorial said a larger community memorial celebration of his life will take place Nov. 15 at a location to be announced. “He was a great man who made it possible for me to be who I am,” said Rick Wood, a D.C. gay activist who said Kameny helped him organize the city’s first gay youth group 25 years ago. Graham, who said he got to know Kameny during Graham’s tenure as director of the Whitman-Walker Clinic, called Kameny an “extraordinary” figure on the Washington scene for half a century. “It is not possible to overstate the contribution that has been made by Frank Kameny for human rights, for gay and lesbian people and for everybody because, in point of fact, he was concerned about everybody,” Graham said. Rick Rosendall, vice president of the Gay and Lesbian Activists Alliance and a friend and colleague of Kameny’s for more than 20 years, read from a chapter Kameny wrote for a book about the early “homophile movement” that was published during Kameny’s early years of activism. Kameny’s message in the book chapter was intended for a gay audience. Kameny’s friends and activist colleagues said they arranged for Kameny’s body to be cremated, based on Kameny’s expressed wishes, shortly after his death on Oct. 11. 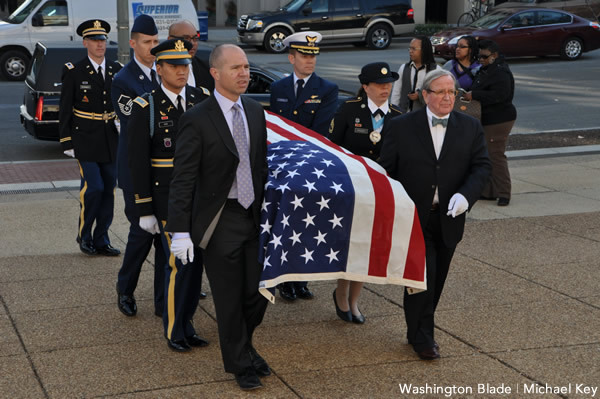 An urn bearing his ashes had been placed in the coffin for the ceremony. Witeck said he and others close to Kameny had yet to decide on a burial site or other resting place for the Kameny’s ashes. One place under consideration, Witeck said, is D.C.’s Congressional Cemetery. What a beautiful article. I can remember back in the day when Mr. Kameny was out there picketing for the equality of gay men and women. He as truly a solider for the cause. Just reading the article had me crying because here is a man who did a lot for the Gay Community. May he rest in peace. We have lost a dedicated pioneer of Gay Rights. I was in DC in the 70’s and 80’s. Frank was always in the forfront of the fight for Gay equality. May he rest in peace.